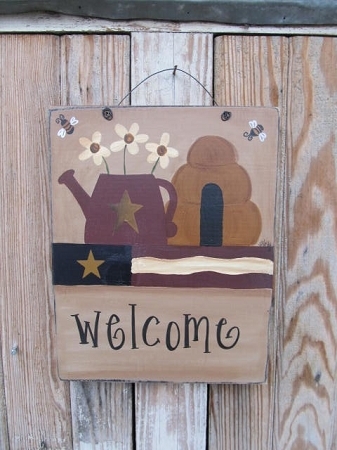 Primitive Personalized Flag Watering Can with Flowers and Bee Hive and Bees Hand Painted Sign. This one combines all summer elements in one. There is an American flag, watering can with cream colored daisy flowers and a bee hive with some bees buzzing around. Sign is solid pine wood, sealed for light outdoor use. Size is 12"x10". Hanging options are available. Shown with sawtooth hanger. Personalization can be written as you'd like. This one is shown as an example. Hand painted, designed and signed by Heidi.